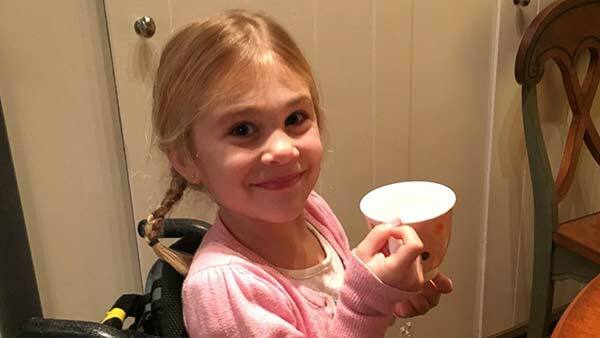 PALOS VERDES PENINSULA, Calif. -- A 5-year-old girl who's been paralyzed from the waist down is not letting her injury kill her spunky spirit, ABC News reports. "One thing that's amazing about Eden is she has not changed throughout this whole ordeal," mom Kylee Hoelscher of Palos Verdes Peninsula, California told ABC News today. "She's still her same laughing, giggly, silly self. She wins over the heart of everyone she knows. It's amazing that her spirit has completely gone unchanged. The doctor said that's one of the things she has going for her. In physical therapy, she won't cry or get mad, she'll just try as hard as she can." Hoelscher, 36, said her daughter Eden has always been quite the adventurer. "She just came out of the womb with so much energy," Hoelscher said. "She's done gymnastics, ballet, got up on a scooter, gets in the pool and swims, go for hikes all the time ... she loves being active. She's just unstoppable." On the morning of December 23, 2015, Hoelscher said she, Eden, and her eldest daughter Isabella, 9, were preparing to do some Christmas shopping when the unthinkable happened. "I had gone in to take a shower," Hoelscher recalled. "I walked by the girls [before] and Eden was doing a backbend and I said, 'Eden, just be careful.' All of a sudden, my other daughter came in and said, 'Eden's on the floor, crying.'" Hoelscher said she consoled Eden as she cried. The 5-year-old then calmed down, walked to her room and put her boots on so she, her mother and older sister could leave for the store. But a few minutes down the road, Hoelscher said Eden began complaining about her legs, so she turned the car around and went back home so Eden could relax while she read her a story. "I said, 'Just lay lay down and take a nap, maybe you'll feel better,'" Hoelscher said. "She kind of looked at me and said, 'Mommy, it feels like my legs are asleep,' but her legs were in this strange position, so I said, 'Eden, move your legs. She said, 'I can't.' Then, I stood her up and her legs buckled under her and we went to the emergency room." Hoelscher took Eden to Torrance Memorial Medical Center in Torrance, California, where an MRI found a contusion on her spine. Doctors informed Hoelscher and her husband Nicholas that Eden was paralyzed from the waist down. Hoelscher said she still cannot fathom how her daughter, who's always been so active, injured herself from a simple gymnastics move in her own living room. "I think that's what makes it so hard," she said. "The damage, it's her entire spine and it doesn't make any sense at all. It's just a backbend and it's just devastating. You go from watching your 100 percent independent kid who dressed herself, put her hair in a pony tail ... to not being able to get out of bed and it's almost impossible to bear." Eden's neurological physical therapist, Julie Hershberg, of [re+active] physical therapy & wellness in Los Angeles, told ABC News that Eden's injury and the way that it happened was an uncommon occurrence that her doctors are unable to fully explain yet. "It's just one of those enigmas," she said. "[Eden], she is a tough little girl full of a lot of fight and determination. Kids could be hard to keep on task and focused, but she is probably the hardest working child or adult I've ever worked with ... I think that's going to go a long way in her recovery. She just blows me away." A friend of the Hoelscher family has created a GoFundMe page to raise money for Eden's medical needs not covered by insurance. "We tell her, 'Everything we are doing to get your legs working again, we're doing,'" Hoelscher said. "The worst case scenario is always in the back of our minds, but we never want to put in her head that recovery is not possible." In addition to losing her ability to walk, Hoelscher said Eden's bowel and bladder are no longer functioning and she cannot regulate her body temperature. But despite her medical problems, Hoelscher said she just wants her daughter to be happy. "Even if she doesn't walk again, [I] just want her to know she's the most amazing person out there," Hoelscher said. "She just has this grin that's so infectious ... if she could be the one person that inspires people to go into research for pediatric spinal injuries, if she could help one person, that'd be enough. She's an amazing kid and I just want her to be happy." Hoelscher said Eden now uses a wheelchair to get around, which she's already "mastered wheelies" in.